This tutorial will walk you through the functionality and the main features of RadDiagramShape. Before proceeding with this topic, it is recommended to get familiar with the visual structure of the RadDiagram . The RadDiagramShape. Position property is of type Telerik.Windows.Diagrams.Core.Point and it gets or sets the coordinates of the top left point of a shape. By default, its value is a Point with coordinates (0,0). You can add content in the RadDiagramShape using its Text property. It allows you to define the content as a string. Each RadDiagramShape has 5 default connectors - Top, Right, Bottom, Left and Auto. Those are the predefined points where you can connect a RadDiagramConnection to the shape. 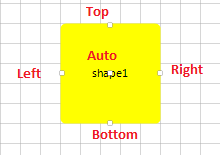 Auto- the connector positioned at the center of a shape. If you attach a RadDiagramConnection to this point, the connector point of the connection will dynamically change based on the shortest path to the shape. All connector points of a shape can be accessed through the RadDiagramShape.Connectors property. It is a collection of RadDiagramConnector items. Each item represents a RadDiagramShape connector and can give you information about the coordinates of each connector point, its position and if the connector is active. A connector is active when the connection tool activates it in order to prepare it to start drawing a connection. Bounds- this property is of type Rect and it gets the width, height and location of the shape's bounds. IncomingLinks- this property is an enumeration that gets all incoming connections. It gives you information about the connections type, starting and ending points as well as the related connector positions. OutgoingLinks- this property is an enumeration that gets all outgoing connections. It gives you information about the connections type, starting and ending points as well as the related connector positions. Rotation Angle - RadDiagramShape supports rotation. You can get or set the rotation angle of a shape using the RotationAngle property. Edit Mode - you can set the RadDiagramShape in edit mode using the IsInEditMode property. 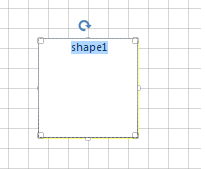 By default, when a shape enters edit mode, the RadDiagramShape.Text is displayed inside a TextBox control so that you can change its value. Shape Selection State - the IsSelected property allows you to track and control the selection state of a shape. 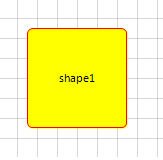 Shape ZIndex - you can get or set the z-order rendering behavior of the RadDiagramShape through the ZIndex property. BackColor - gets or sets the RadDiagramShape background color. BorderBrush- gets or sets the brush that specifies the RadDiagramShape border color if the DrawBorder property is set to true. StrokeThickness- gets or sets the width of the RadDiagramShape outline.